The great variety of bloom color, flowering time, plant height and shape makes bulbs a good addition to any landscape or garden. Spend time planning before planting bulbs in the home landscape. Sketch the plan on graph paper before purchasing bulbs. This advance planning will assure that the proper number of bulbs are purchased. Since the foliage of spring blooming bulbs dies by early summer, this plan will provide a record of where the bulbs are planted in case annuals or perennials are interplanted later. Foundation Planting - Bulbs will add color in the early spring to a foundation planting if planted in a grouping of twelve or more bulbs. Evergreen shrubs planted in the foundation planting will provide a nice background for planting of bulbs. Pay attention to the foliage color of annuals and perennials. The foliage of some of these plants in the foundation planting will make a nice backdrop for groupings of bulbs. Deciduous Shrubs and Trees - Spring bulbs can be planted under deciduous shrubs or small trees in the landscape. Do not plant spring bulbs under evergreen shrubs or they will not have enough light to grow and bloom. The early blooming bulbs receive plenty of light because they start growing long before deciduous trees and shrubs start to develop leaves. Some bulbs that perform well under trees and shrubs include: grape hyacinths, crocus, winter aconites, snowdrops, siberian squill, leucojums, bluebells and early maturing daffodils. By carefully selecting spring bulbs to match blooming dates with the bloom of the shrub, they can provide a beautiful color contrast with early flowering shrubs such as forsythia or flowering quince. They can be used in combination with smaller flowering trees like crabapple, bradford pear or redbud. Border Planting - A border of low growing bulbs such as grape hyacinths, hyacinths or small daffodils planted around the edge of a vegetable garden or flower bed adds interest to these areas. A border of bulbs planted along the edge of the lawn will add a splash of color to the lawn area. Perennial Beds & Rock Gardens - Spring bulbs can be designed into a perennial bed or border to add areas of spring color. The bulbs will bloom during March, April and May before perennials start to flower. Locate the bulbs in the planting bed so the dying foliage will not be noticed. The spring bulbs used in the perennial border can be left in the ground the year around or they can be removed and replaced by other plants after flowering is complete. When planning borders, it is essential to take into consideration the heights and spacings needed by different plants. Ground Cover - Some bulbs can be planted with low growing ground covers like ajuga, violets, vinca minor or English Ivy. The height relationship between the ground cover and bulb flower must be considered. The ground cover should be no more than half the ,height of the bulb flower. The ground cover helps support the bulb stems and protects the flowers from mud splashed by rain or a sprinkler. Lawn Area - The comer of the lawn is a location where the homeowner often develops a landscape planting. This planting usually consists of small shrubs and perennials. One or two groupings of spring bulbs of one color located in the planting will provide a point of focus during the spring months. Containers - Both spring and summer bulbs can be planted in portable containers. If spring bulbs are planted, once bloom is past, the container can be moved to a location out of sight while the foliage matures. If summer bulbs are used, they will add color all summer long to areas such as a patio or a deck. Containers are portable and they can be moved around and used in different areas of the landscape. When relocating a container in the landscape, pay attention to the light requirements of the bulbs and be sure the container has drainage holes. Steep Slopes - Steep slopes in the landscape are difficult to mow and maintain. Daylilies, which have a fiberous root system, are an effective plant to use on these sloping areas. The foliage is attractive and the bloom adds color to the area. By using daylilies, the homeowner eliminates the problem of trying to mow that area of the landscape. As the homeowner develops a plan to use bulbs to add color to the landscape, keep in mind that these bulbs bloom at different times. Weather may have an effect on when bulbs start blooming in the spring, but it will not effect the order or sequence that they will bloom. 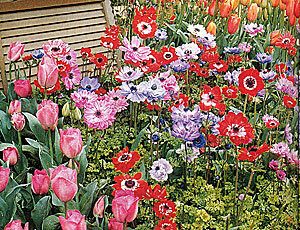 Mail order catalogues may show pictures of many bulbs in bloom at the same time. In nature this does not happen. Some spring bulbs have overlapping bloom periods, but they still maintain their blooming sequence. Spring bulbs will bloom from early February to mid June. Summer bulbs will bloom from early summer to fall. There are a few fall blooming bulbs available for use in the landscape. Mass Planting - Keep in mind that planting bulbs of one variety or color in mass will have greater visual impact. This will provide uniform color and texture that is pleasing to the eye. Bulbs will be easier to care for since they will have the same cultural requirements and the foliage will mature at the same time. Never plant bulbs in a single straight row or in a single circle around a tree or bush, except in very formal gardens. Bulbs look better when they are planted in mass. Plants don't grow in a single straight line in nature. They tend to grow in irregular masses. Grouping Bulbs - With the major spring flowering bulbs such as tulips or daffodils, plant at least twelve bulbs of one variety in a grouping. The more bulbs planted of one variety and color, the greater the impact. The smaller spring bulbs should be planted in groups of 50 bulbs or more to have impact. The bloom of a few of the smaller bulbs is very insignificant. Smaller bulbs need to be viewed close-up so they should be planted along sidewalks, patios or entry ways to the home. Most summer flowering bulbs have larger blooms, so fewer bulbs are needed to make an impact. Three to six bulbs are suggested as a minimum number of summer bulbs of the same variety to plant in a grouping. Bulb Heights - Consider the natural height of the bulbs before planting. In general, taller growing bulbs should be planted to the rear of the planting area. Shorter growing bulbs should be planted to the front. An exception to this rule would be the situation where a shorter bulb emerges and blooms early before the plant located in front grows large enough to screen it. Once the bloom period is past, the front plant will screen the maturing foliage of the shorter plant. Tall growing tubers like the tall dahlias should be used in the corner of the garden or yard where they are viewed from a distance. The dwarf types can be used as facer plants. 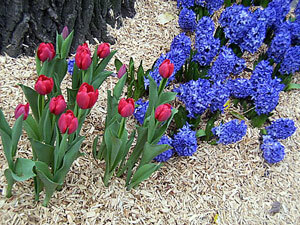 Planting Small Spaces - Plant bulbs of one color in small spaces in the landscape. One color will have greater impact and make the planting space look larger. Mixed colors planted in a small space will make the space look even smaller. Planting Large Spaces - In areas of the landscape where there are large spaces, a planting of two or three colors can be effective. Concentrate the bulbs for each color together and do not intermix them. Select colors that blend together. White flowers can be effective in helping blend colors together or to brighten dark comers. Interplanting - The color of spring flowering bulbs is enhanced when interplanted with pansies or other compatible early flowers. Summer annuals such as petunias or marigolds can be added later. Summer annuals do a poor job hiding the dying bulb foliage but they will extend the color of the planting bed through the summer. In small planting areas, it is more effective to interplant with one color of annual, with perennials like ajuga, Brunnera (Forget-Me-Not), or some of the small Hosta. The color of summer flowering bulbs will be enhanced when interplanted with summer flowering annuals such as petunias, marigolds and other annuals. Many of the summer bulbs are tall and the lower part of the plant unattractive after bloom. Plants like lilies and dahlias can be interplanted with perennials, annuals or shrubs to hide the lower stem area. Daylilies are a good choice to hide the lower stems of the lily. The new dwarf forms of daylilies like Stella de Oro (pictured at right) do an excellent job of facing a bed. Color Considerations - Colors give us a feeling or perception of either warmth or coolness. Cool colors are shades of blue, violet and green. Warm colors are shades of red, yellow and orange. To the homeowners eye, warm colors are perceived as advancing while the cool colors seem to recede. Cool colored flowers will recede even more if they are placed in the shade. The perception created by warm or cool colors can be used by the homeowner in planning flower plantings in the landscape. When planted at a distance, warm colored flowers will appear closer while cool colored flowers will appear farther away. A planting of cool colored flowers at the rear of the yard will make the yard seem larger. Warm colored flowers planted in the rear of the yard will make the yard seem smaller. Plant cool colored flowers closest to the point from which they will be viewed since cool colors are best viewed close up. Cool colored flowers are very effective near a patio or next to a sidewalk. Warm colored flowers are effective in bringing a distant part of the yard into focus. Warm colors will create a dramatic display in any yard or garden and will draw attention in the landscape. Naturalizing - Naturalizing is the process of imitating nature with bulb plantings. In nature, bulbs do not grow in rows. The flowers appear in irregular clumps scattered over the landscape. There are several early spring bulbs that naturalize easily in grassy areas. Some of these include: snow drops, winter aconites, crocus, squill and daffodils. Keep in mind that the foliage cannot be mowed off until it dies down naturally or the bulbs will eventually die out. Daffodils are a good naturalizer. Since the foliage does not mature until the end of June, most homeowners will end up mowing off the foliage. 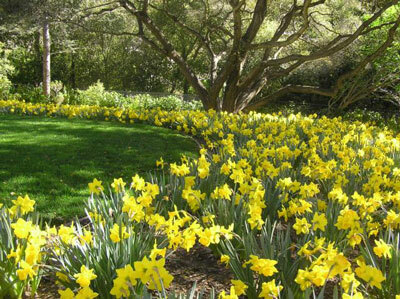 In the home landscape, daffodils must be located in an out of the way location where lack of mowing can be tolerated. Always save space for the fall blooming crocus, Colchicum.